I was disappointed, to say the least, when the damson jam and damson cheese that I made turned out to be very tasty, but slightly grainy damson toffee. I scoured the internet for a solution and found people with the same problem were given only vague suggestions of how to solve it. It’s a common problem, I gather, because of the high pectin content in damsons. I blame it on the fact that I boiled the mixture too quickly and for too long. We decided to make the best of a bad job by taking the matter into our own (sticky) hands. I turfed both lots of preserve back into a pan with a kettle full of hot water and slowly melted down the thick globules of jam until it was a homogenous syrup. I then got Ed’s help to sieve it to get rid of any lumps and brought it back up to a rolling boil for 5 minutes to reset it, using the ‘cold saucer’ method to check for a set. We now have 5 jars of perfectly smooth lightly set damson jam…and a kitchen ‘what looks like we done a murder’. Delia is good on damson jam. Basically everything well boiled before you put any sugar in. Our damson turned out fine. Better to have it too runny rather than overcooked. I don’t attempt to take out the stones as they add to the flavour and it’d take hours anyway. Just did a plum “clafoutis” which is basically yorkshire pudding with fruit instead of sausage. Looking forwards to sloes and something french called “prunelle” which I’m going to have a go at. What a cool photo. Glad it all turned out in the end. Glad I am not the only one with plum jam problems. Two years running I have made greengage toffee and it is useful to know that the pectin content of plums can cause problems. I had wondered about making a Fruit Leather, which is eaten in strips as a sort of fruity toffee. I would have been an experiment but I would have poured it into shallow trays (perhaps on greaseproof paper) and then cut into strips. Next year though, I will crack the jam problem! The boy wanted me to make some sort of fruit leather with it, but I could see that ending up in a sticky mess! Sadly don’t have that problem, or any problem of a glut of soft fruit here but storing away that info about damsons for the day that I do. 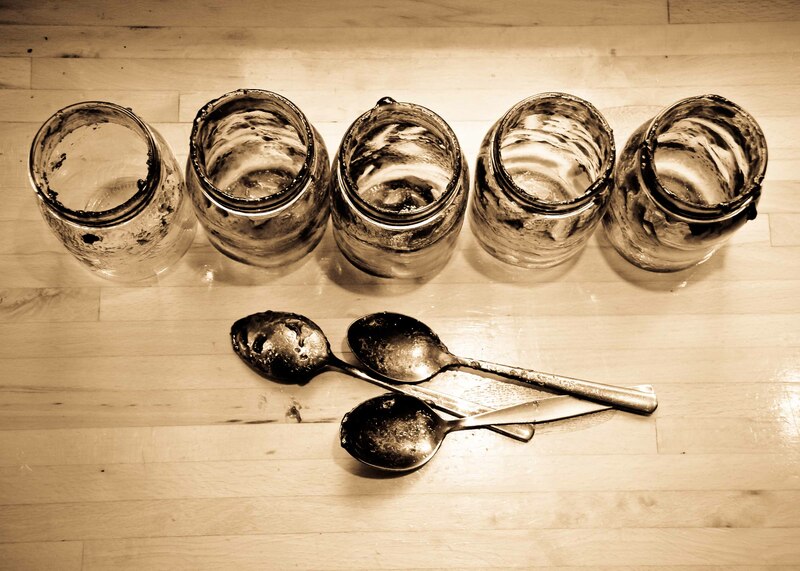 Absolutely love the photo with the blackened jars and spoons. I discovered a gold mine of Damsons quite by accident in a parking bay here in South Australia some years ago and I have been building up my stocks ever since. My cellar soon resembled the store room of a Farmers Market with jars of Delia’s chutney, Pickled Damsons and jars of Damson Jam of course. Alas, I moved from the area and Ino longer have a cellar. Just to let you know the draw power of the Damsons still entices me to make a 300 mile round trip every couple of years returning with loads of the goodies. Just thought I would let you know that we Damson people are a world wide bunch!!! ……….. Michael.